When measuring the properties of an aerosol, the particles have to be rendered measurable in terms of particle concentration for the device to be used and this is often done by dilution. The Society of German Engineers (VDI) report no. 1973 from 2007 proved that a reproducible aerosol dilution is possible with the use of a Palas dilution system with as low of a ratio as 1 : 100,000. 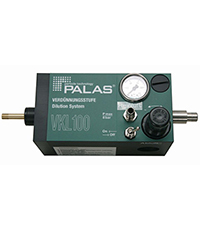 The ejector principle is utilized throughout all of Palas’ dilution systems and is a vital component of the German engineering norm (VDI 3491-15). With “cascading” of the individual dilution steps, the dilution factors of 1,000, 100,000 and 1,000,000 can be achieved. 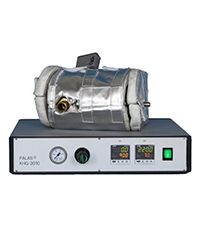 Depending on the model variants chosen by the customer, the dilution steps can be configured for isothermal dilution of hot aerosols up to 200°C and for pressurized dilution up to 10 bar overpressure. Models fabricated from stainless steel have been used successfully worldwide for handling corrosive aerosols. The "partial flow dilution system" VDD is recommended for diluting large droplets ( > 5 µm). 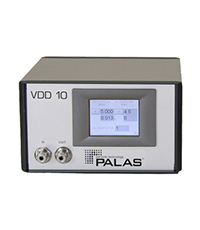 The Palas dilution systems are built to be robust, simple to operate, and provide a clearly defined dilution factor which can be checked by the users themselves on-site. Deliver a constant and representative dilution with factors of 10, 27, or 100. By cascading several VKL systems it is possible achieve a dilution factor of up to 1 : 1,000,000. To reduce the influence the measurement process has on the aerosol, the entire measurement chain has to be configured to provide isobaric and isothermal conditions. Ideal for diluting liquid aerosols because of its ability to provide a variable dilution factor and minimization of losses with large droplets.